- culture of place as expressed in the architecture, streetscape, heritage architecture, noise, colour, street life, energy, vitality and lifestyles. The city of Sydney has many buildings with relatively modern, distinctive architectural styles such as the Sydney Opera House and the Harbour Bridge, however heritage style architecture as one of the distinctive features of city. Many housing developments on the outskirts of Sydney since the 1980s have been constructed by the project home industry. Project homes are also a common option for “knock-down rebuild” porperties in the middle-ring suburbs. Designed for the average family, these homes are typically very large in size, take up a large proportion of available land, and tend to provide more space per person than any other affordable housing type in Sydney’s history. They tend to blend a range of different architectural styles, and offer exterior aesthetics based on a “contemporary”, “classic” or “heritage” look. They can consist of a formal living room, a rumpus room, a formal lounge, 4 or 5 bedrooms, a grand entrance, and often a central staircase. These constructions tend to create a homogeneous neighbourhood. Heritage buildings in Sydney generally fall into one of the following categories of architecture: Gothic Revival, Georgian, Classical, Romanesque, Italianate, Federation, Edwardian, French Second Empire, or Queen Anne. A large number of heritage buildings remain in Sydney. In many cases, these buildings are restored and renovated to ensure their continued use. In other cases the facades of heritage building are retained, while more modern buildings are constructed around or behind them. The Town Hall and Macquarie Street precincts are examples of the heritage architecture found in Sydney which has been maintained and restored. Three landmark heritage buildings are located in the vicinity of Town Hall on George Street - the Queen Victoria Building, Town Hall and St Andrew’s Cathedral. The Queen Victoria Building, built in the 1880s, has been restored to enhance the remaining Victorian features of the building, including restoration of the external sandstone façade and carvings, use of a Victorian-inspired colour theme and tessellated tiles for flooring. In addition, modern shop fronts have been designed to minimise distraction from the original features of the building. Sydney Town, located adjacent to the QVB building, is based on French Second Empire architecture. Begun in 1868, it is built from sandstone sourced from nearby Pyrmont. The architecture includes mansard roofs, wrought iron cresting, a large stepped entrance, and balconies and platforms suitable for public receptions. Recent restoration work has included restoring and cleaning the façade and the clock tower. In some cases this has involved re-carving intricate pieces of sandstone. Article: Old trade, new look: stonemasons carve town hall a new face. Watch the Stonemasons in action at Sydney Town Hall. Next to the Town Hall is St Andrew’s Cathedral. The oldest cathedral in Australia, it was completed by 1868, and was designed based on Gothic Revival architecture. It contains a hammerbeam roof, carved sandstone ribbons and piers, marble and pressed-design tiles, and stained glass windows. In 2000, the cathedral underwent a major restoration. The entire floor of the cathedral was lifted, cleaned and relayed. Any damage tiles were replaced. The Macquarie Street precinct contains a number of early colonial buildings including the Hyde Park Barracks, NSW Parliament House, the Mint, Sydney Hospital, and St James Church. Sydney Grammar School, St Mary’s Cathedral, Government House, the General Post Office, the Great Synagogue, the Strand and Customs House are located nearby. Several of the buildings were designed by architect and convict Francis Greenway between 1818-1822. Each of these buildings has had ongoing restoration work completed. In some cases it is not appropriate or cost effective for heritage buildings to be restored, or the previous use may deem much of the building inappropriate for future use. The Central Park Development on Broadway, Sydney, is located on the former site of the Carlton and United Brewery. The Brewery began operation in 1835 as Kent Brewery, and was acquired by Carlton and United in 1983. The brewery ceased operations in 2005. Frasers Property and Sekisui House are jointly developing the site which includes the brewery, along with a large number of buildings and associated structures, and some nearby properties. Some of the industrial buildings will be retained and converted, and some will be demolished. Some items that represent the history of the site will be retained such as signage, and machinery such as beer vats and malting tanks. Two heritage streetscapes have been retained and restored, and terraces, pubs and warehouses nearby have been revitalised for cafes, shops, galleries. The oldest buildings in Sydney are located in and around Parramatta including Old Government House and Experiment Farm, and Elizabeth Farm in Rosehill. 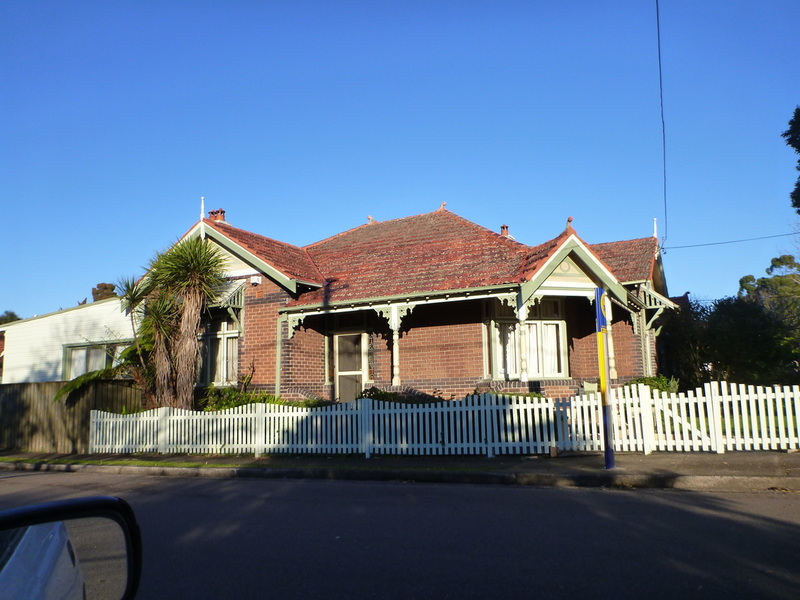 Terrace houses were a feature of Sydney from the 1830s and are seen in the inner suburbs. They are common in suburbs such as Paddington, The Rocks, Ultimo, Kirribilli, Balmain, Newtown, Bondi Junction, Milsons Point, Forest Lodge, North Sydney, Glebe, Surry Hills, Alexandria, Redfern, Leichhardt, Erskinville and Darlinghurst. Terrace houses were usually constructed in rows, and most commonly were two stories. They were often decorated with filigree of cast-iron or wrought iron, parapets, and detailed dividing walls. Workers cottages were popular in the Victorian period (1845-1900). These often had cast-iron lacework, bull-nosed verandahs or hipped roofs, and at times timber fretwork. Many timber cottages have been demolished, but many weatherboard cottages remain. Workers cottages developed at a time when industry was thriving in the city, and people were most likely to walk to work. They were common in inner city suburbs such as Leichhardt, Surry Hills, Redfern and Balmain, but were also found in other suburbs nearby to industries. In Homebush, workers cottages developed close to the abattoirs and brickworks. Brick workers cottages became more popular as bricks became less expensive. Federation architecture occurred between 1890-1915. Common features of these homes are decorative timber features, tall chimneys and roofs, fret work, Australian themes and verandahs. A Federation home had a large garden, and was a sign of prosperity. Following the end of World War I, as a result of a lack of tradesmen and supplies, Federation Homes were seen as too extravagant and went into decline. 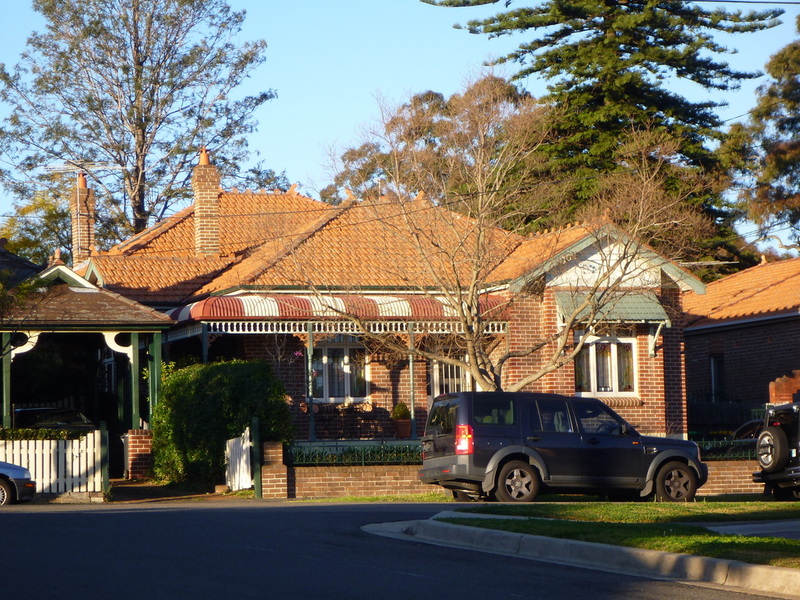 Suburbs with examples of Federation homes include Penshurst, Turramurra, Millers Point, however they are common in many areas as the availability of cars increased the suburbanisation of Sydney. Californian Bungalows were constructed between approximately 1915 and 1945. These are defined by gabled roofs, pillars supporting a verandah, stone, brick and timber materials, and are traditionally painted in dark greens, reds and blues. Californian Bungalows are common in the suburbs of Ashfield, Concord, Lane Cove, Beecroft, Pennant Hills, Coogee, Clovelly and Parramatta. These houses reflected the changes that were occurring in the society. They were less pretentious than Federation houses, more accessible to the average person and lanes down the side of the house allowed space for a car. Streetscapes vary greatly from suburb to suburb depending on factors such as age, density, land use, and ethnicity. Suburbs close to the city centre, or parts of suburbs which are close to major transport nodes are more likely to have streetscapes impacted by high densities housing developments. In older areas, this may mean fairly uniform streetscapes with blocks of 2 to 4 storey, red brick or cream unit blocks, limited trees, and garages visible from the street. In newer developments much larger blocks of units are likely with many balconies facing towards the street, large driveways and some landscaping. Suburbs with distinct heritage features will often have the facades of shop fronts preserved to reflect the period of development. An example of this is The Strand, the main street of Croydon, and nearby Edwin st. The railway station and commercial properties including the Croydon Post Office are considered significant buildings and have been preserved. The commercial streetscape is a broad shopping street with gardens running down the middle of the street. Shops have recessed balconies, semi-circular brick arches, parapets, stained glass and glazed, and ceramic tiles. A wide awning joins the shops together, and heritage colours are used. Homes in the Victorian, Federation and Californian Bungalow styles are common in nearby streets. Residential streetscapes in Croydon are dominated by tree lined streets, chimney stacks, gables, and ridge capping. Homes are usually set back from the road, providing a uniform look along the street. Suburbs with a distinct ethnic character often have this reflected in the streetscape. Signs are often multi-lingual, and cultural symbols are often seen in architecture or public art works. The streetscape of Cabramatta reflects the dominance of Vietnamese and China culture. John Street, the main street, is dominated by the Pailau Chinese gateway, adorned with Chinese symbols, and script in Chinese, Vietnamese, Khmer and English. Nearby a number of stone statues of animals line the main street. These animals, including dragons and lions, are considered in Chinese culture to bring luck and prosperity. The streetscape is also influenced by the prevalence of shops trading beyond the boundaries of their shops out onto the footpath. This gives the main street a “market-style” feel and look. Red and gold trim are also used on many shops which further contributes to the Asian-influenced streetscape. Temples and shrines have also influenced the streetscapes of Cabramatta, with the use of gateways, stone statues, vibrant red, yellows, blues and gold. Low-density, suburban development of Sydney followed World War II. It was constrained by a shortage of housing materials and as a result, fibro cement became popular for working class houses in areas such as Fairfield, Guildford, Liverpool, Blacktown and Penrith. Some cream and red brick homes were also built in these areas. Many of these homes have been subjected to the “knock-down rebuild” phenomenon and as a result suburbs in these areas have streetscapes which are varied with a mix or older housing and new. Brick was used for homes in middle class areas such as Winston Hills. On the outskirts of Sydney, as land becomes available for development it is common for housing developers such as Delfin and Mirvac to develop land enmasse using a set of standard houses to create designed suburbs, or masterplanned estates. The result is somewhat uniformed streetscapes of McMansions. Homes close to the street, with large garages, vaulted entries, columns, and large windows. Roofs lack eaves to allow house to be built closer together, and are built with narrow fenceless frontyards to make the most of available land. These estates are common in Kellyville, Baulkham Hills and Castle Hill, and many areas currently under development. Street life in the city of Sydney is mainly determined by the commercial activity taking place. During the day the city is bustling with workers from nearby businesses and tourists enjoying the sites of the city. At night the pubs, clubs, theatres and restaurants encourage people to use the city to socialise and relax. In some suburbs the street life is influenced by the dominant ethnic community. 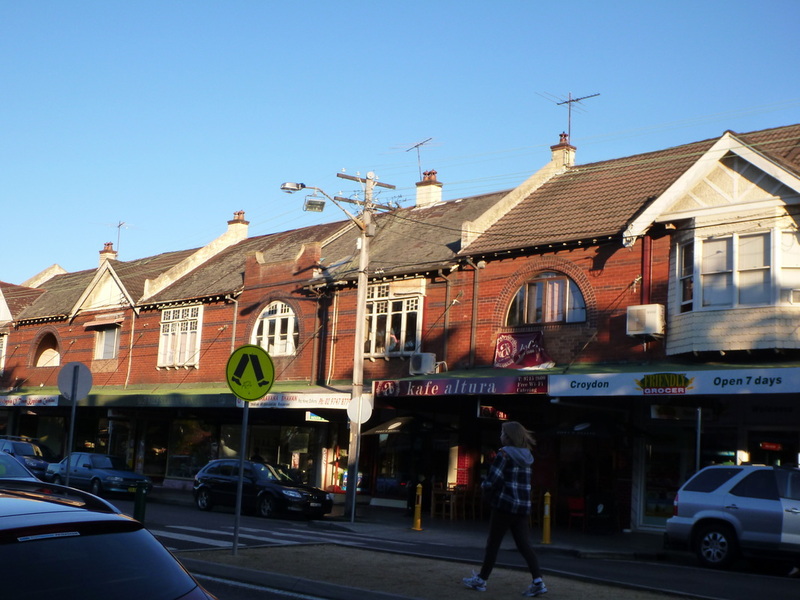 In Kingsgrove, or Guildford, street life is influenced by the large Arabic population, who like to congregate in the front yard, porch or in the garage and socialise with those passing by. In Leichhardt, the Italian café culture encourages people to socialise in alfresco cafes. In newer residential areas with a young population street life is dominated by cars being washed, lawn mowed, bike riding, cricket games and children playing in parks. In other newer suburbs, the activity of children is contained within the house and street life is limited. A concentration of events, people and facilities can be found in the inner city of Sydney and other smaller centres within Sydney such as Parramatta. These locations are hubs of activity, exchanges of ideas, and social activities and as such foster energy and vitality. Greater concentration of venues such as hotels and theatres are also likely to be found in these centres and are likely extend activities into the night. Suburbs with younger populations are found in the Blacktown, Liverpool and Campbelltown Local Government Areas and would tend to have more energy and vitality than those with older populations. The greying areas such as Pittwater, Hunter Hill and Kuringgai are likely to be quiet and subdued. Coastal suburbs can be association with blue and yellow, representing the colours of the water and sand. Suburbs located near large national parks or areas of bushland could be seen as green suburbs. This would include St Ives, North Waroonga, North Epping. However the real green suburbs are those which have been designed to integrate environmentally friendly initiatives, for example Newington. Other green areas are those that have a high proportion of green voters, common in the inner west. Some older suburbs with heritage buildings use colours such as dark greens, maroons and blues. For example, Canterbury Council has strict regulations about the colour that homes can be painted in Ashbury. It uses a fairly strict colour palette to maintain uniformity in the suburb. Some suburbs can be associated with the colour pink due to their large gay and lesbian populations. These suburbs are also likely to be associated with a rainbow, the symbol for gay pride. These suburbs include Surry Hills, Kings Cross, Newtown and Leichhardt. Many newer suburbs in designed estates use fashionable colours such as stone and grey. As such the whole suburb is influenced by the colours preferred by the development company. Grey suburbs are those dominated by older age groups such as Bayview, Narrabeen and North Turramurra, reflecting the location of large retirement villages.